Note that actual progress in CPUs is very slow. So this is almost same as current models. Wow. My PC ia actually still on an AMD X4 965. Always good to know great value options. Edit: can't find them that cheap in Germany. But well well maybe if its time to build a new pc, I still have the option to import. Geez some of these were like $2500 chips when new a few years ago. Most fun thing is that used prices on i7 is very close to retail. I just reviewed these vs i7 3960x 6-core.. Turns out AE is not very good at MP - and the same goes for PPro. Best to get higher clock per core..However Maya and Nuke are better in this regard. So for a dedicated AE render buy a combo with mobo + 3960x and add 32GB DDR3. And OC it. For Maya and Nuke these 10 and 12-cores are better. Even better are opteron server farms. 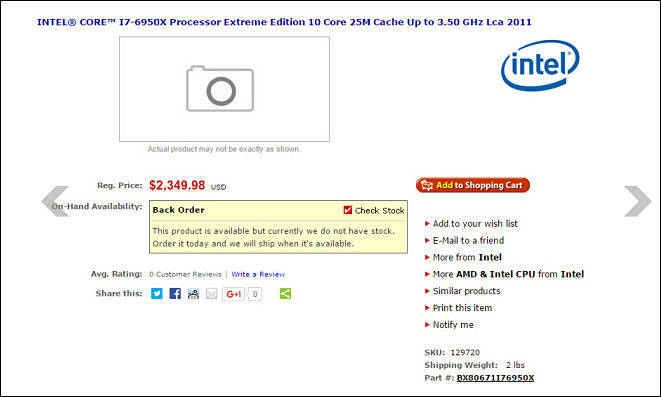 You can get 48 cores for about 500USD..
You mean that this $89 oldder one Xeon is better? It was made on the same die as the 3960x but underclocked and locked to that frequency. Intel's decision - I assume to allow for usage inside a smaller case, and allow for cooler 24x7 operation. The best option is a nice LGA2011 mobo with i7 3960x OCed to 4.4 GHz with 32GB DDR3. Reports indicate that OCing DRAM does not offer much of a speedup. Some of these mobos have a NVMe slot - the Samsung 256GB sm951 is great value. A great value air cooler is the Noctua NH-D14. And use a RAM heatsink, or other small ones for the sm951 to prevent throttling. Now you have a system that is maxed out in every manner - no bottlenecks anywhere. As for prices you can get a combo mobo and i7 LGA2011 3960x for 300$ - buy new DRAM, as its the first part that conks out :-) But Im sure you are aware of this..
Where can you get the 64 core opterons? Can you point to better offers? As I understand it is not true. last time I checked you could find cheaper MB for this Xeons. example for E5-2650 v3 ? Just started doing a 4 port sata raid 5 (w/ bios) array with my asus mobo. These motherboards you are posting have 10 sata ports, that's a lot. If anyone is interested in 64Gb of DDR4 memory (2 sticks, 32Gb each) please message me, I have some for sale. Any news on how the system is working? Should we expect significant price drops on cpus like the 6900k and 6950x?